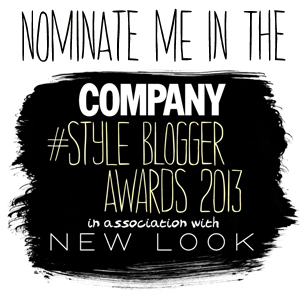 I have entered my blog into the Company Style Blogger Awards 2013! I have never entered anything like this before but I thought it was worth a try. I know there are some amazing blogs out there & competition will be tough but I would love it if you could nominate me! All you have to do is click the link above & nominate my little blog! Is there a specific category that you wanted to be nominated for or does it not matter? I don’t mind Sarah, whichever you think I fit best 🙂 and thank you very much! 🙂 Best Personal Style Blog is what I think best, I hope I did it right, to comment, I think you have to sign into FB and I dont really ever use my account, but I hope it worked 🙂 good luck! Thank you so much Sarah, that is the one I nominated myself for 🙂 Thanks again!